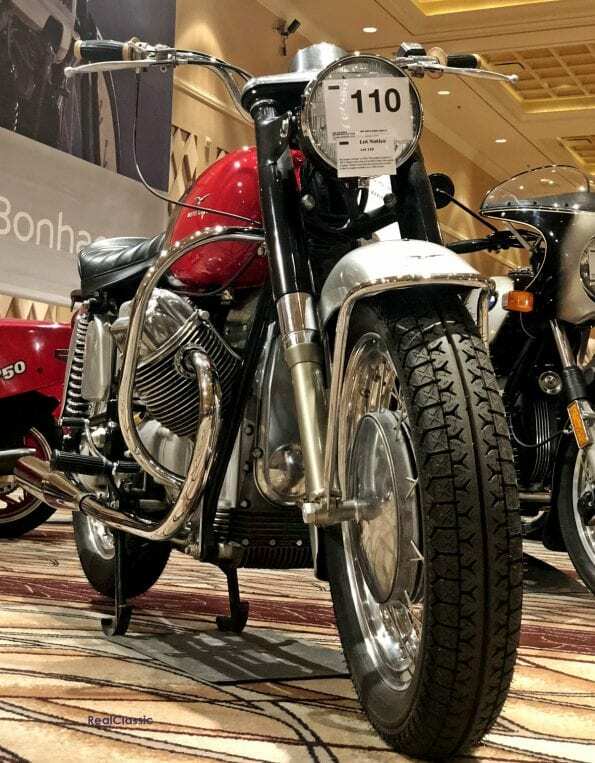 The most difficult part of writing this report is describing the sheer volume of machines present at this year’s Las Vegas vintage bike auctions. 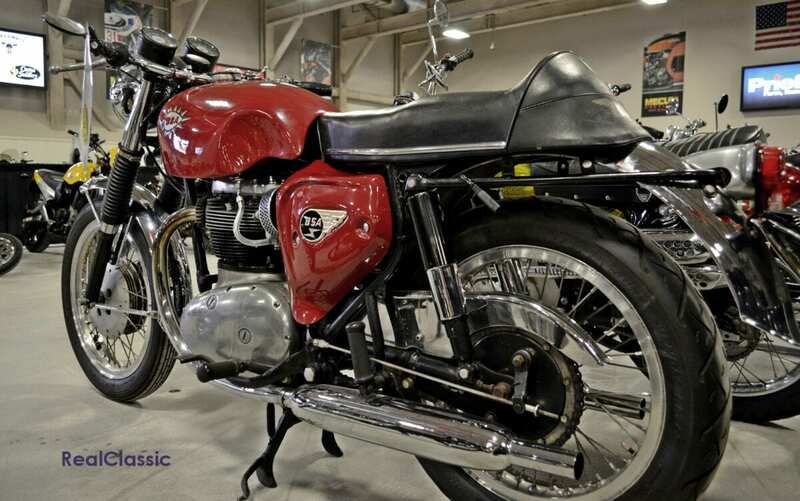 It’s almost overwhelming, with nearly 2000 classic motorcycles offered for sale across two separate events in January. 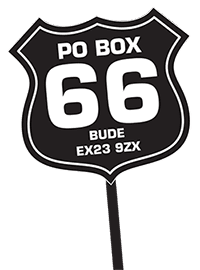 The first of these annual events is staged by the British auction house Bonhams, while the other is hosted by US-based Mecum, formally Mid-America. 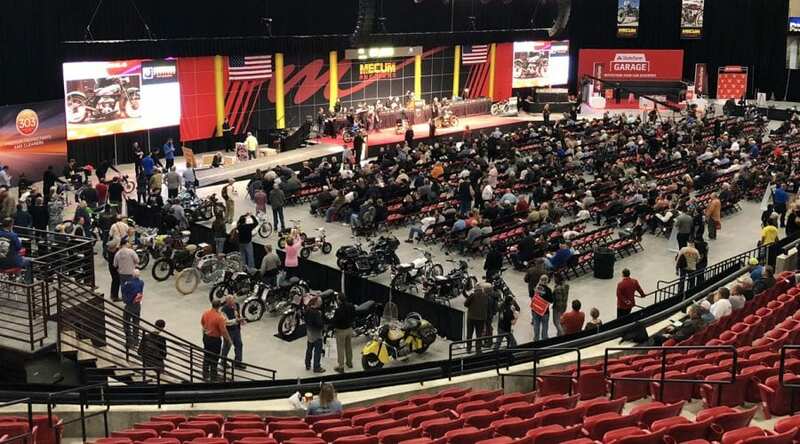 The Mecum ‘home team’ has a tremendous logistical advantage which partly explains why their lists are so much longer, but that doesn’t detract from the firm’s investment and promotional skill in creating an unforgettable moto-spectacle. Not totally outdone, Bonhams’ reputation for offering rare exotics in a posh, personal atmosphere remains intact – and admission was free to the Bonhams’ sale at the Rio. Compare that to Mecum’s street ticket of $30 a day. Those looking for a market upswing would be generally pleased at the prices seen in Las Vegas this year, and the action was fast and furious at Mecum. I estimated about 90 seconds of stage time per machine there, not at all surprising given the total number slated for the turnstile during the five days of bidding. 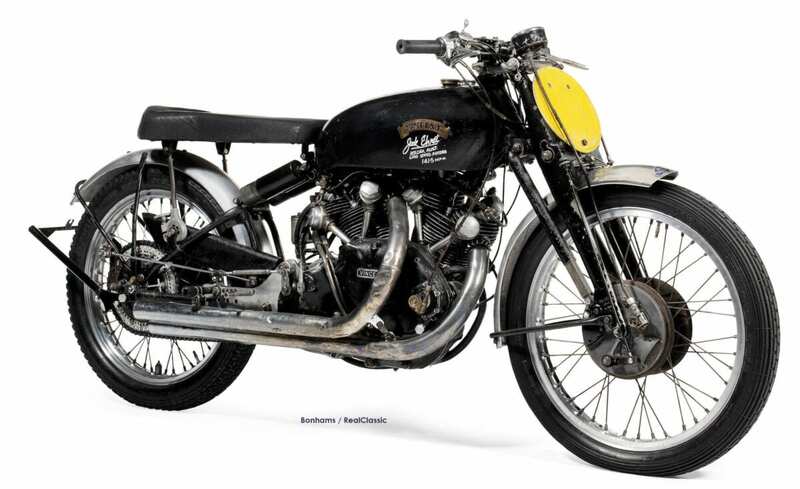 The big news was Bonhams sale price of nearly £100,000,000 for an Australian-raced Vincent Black Lightning, and the press release that followed claimed the buyer was returning the machine to that locale. 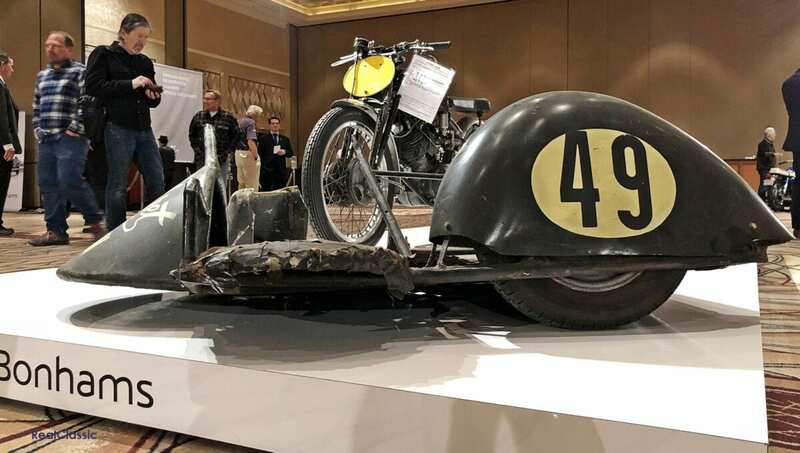 The price was touted as a world record by Bonhams and that statement caused some confusion, given that a TE Lawrence Brough SS100 sold for a million some years ago. A fair amount of exotics didn’t meet reserve at Bonhams but that’s commonplace when selling high-end items. The following is a just a sample of the machines Alex and I photographed in Las Vegas 2018; some noteworthy for price, others by offering exceptional value. Full information on both auctions is available via the links at the end of the feature. Phil Vincent’s twins rank near the top for enthusiasts everywhere, be they touring Rapides, tuned Shadows or exotics like this ex-Tony McAlpine, Jack Ehret record-breaking Black Lightning LSR racer from Australia. One of around thirty made, it is said that less than twenty have survived, making this documented example a rare and exclusive opportunity for the Vincent aficionado. The seller and Bonhams included all the original parts used by the bike’s five owners after being re-commissioned by Vincent specialist Patrick Godet in France. Also included were various bits of streamlining and a tube frame chair for sidecar racing. It really looked the part with carefully preserved, just-raced patina, so many visitors stopped to marvel at this ultra-rare and desirable machine. Built under the direction of Vincent engineer Phillip Irving – well known to being quite involved in the process of prepping the firm’s factory racers – the Black Lightning model was immortalised when Rollie Free rode to a new world’s record at Bonneville in 1948. Available only by special order, racing trim included a tachometer, magnesium brake plates, special racing tyres on alloy rims, rear-sets and more, trimming the Vincent to a feathery 360lb. The 50-degree 998cc twin was heavily massaged using higher lift/longer duration Mk2 camshafts, polished conrods and crank flywheels, plus the fitting of 13:1 pistons. The fuelling has been converted to run on regular pump gasoline. Fully ported and polished the heads received larger inlet ports to carry the mixture from two 1¼-inch Amal 10TT9 carburetors. Generating 70bhp at 5600rpm, the thrust was directed to the wheel via a modified clutch and a strengthened four-speed gearbox. Following the one-year only, limited edition A65 Lightning Clubman, in 1966 the high performance Spitfire emerged as BSA’s fastest production machine to date. Based on the standard Lightning, the Spitfire Mk2 fit two-way dampened forks, Girling shocks, shouldered alloy rims and 12V electrics. The 654cc ohv twin was boosted using high compression 10.5:1 pistons and twin Amal GP carbs with velocity stacks. Among the very quickest British parallel twins, the Spitfire could approach 125mph. US importers fitted taller handlebar, forward set controls and a small tank to compete with the Harley Sportster, but starting in 1967 a larger five-gallon tank joined a hump seat and fairing as additional options. Finished in factory red, this original-looking, 5700 mile beauty wore filtered Amal Concentrics and hinted that a previous owner was aiming for the more traditional UK configuration with a lower handlebar and optional fuel tank. Free of the frilly add-ons which many US buyers love, the Spitfire’s subdued persona stopped me in my tracks. Still trailing Triumph’s Bonnie and the Norton Commando on the affection scale here, there’s a strong thread of Beezer enthusiasts stateside who recognise the A65’s obvious merits and its understated charm. The hammer price of just under $11,000 demonstrates the Spitfire’s comparative rarity and the condition of this well-maintained example. Even a casual observer can look at the skyrocketing value of Ducati’s bevel twins and wonder where it’ll end. The 750 Super Sports had already left the ranks of affordability when Guns ’n’ Roses arrived on the scene, so it’s hardly a shock to see the 900 Desmo rapidly closing the lead. An early 750 (valve spring) Sport cleared the $50k mark at Mecum, and even the standard GTs have become shockingly expensive. If you’ve been saving for an early Ducati twin it’s time to take stock: prices are not dropping and demand is strong. One look is all it takes to see why. It has been said that long-time Ducati engineer Fabio Taglioni designed the 500cc Pantah to replace the unpopular parallel twins; history confirms that the belt-drive Desmo cast the mould for all future models. Listed as a 1981 with zero miles since restoration (the front mudguard should be flat black), this era of 500SL used 9.5:1 compression pistons, two PHM 36mm Dell’Ortos and a Bosch electronic ignition set in a totally new crankcase. The frame and suspension were also fresh and gave the 397lb Pantah a substantial boost in useable, roadgoing performance. In many ways the Ducati Pantah 500SL is a far more important machine than those flashy 900 Desmos, yet it still flies under the radar and so allows the more fiscally-challenged Ducatisti a place inside the circle. In the past, the relative obscurity of Moto Guzzi’s twins prevented the V700 getting the fame it deserved, but that could be changing. The first of these new Guzzi twins arrived on US shores in late summer 1967, and this nicely renovated 700 might have been among them. The design had won Moto Guzzi a profitable contract in Italy, followed by the contractors taking over the failing company. The shaft drive, 90-degree twin was at least 50cc larger than contemporaries from Britain or Germany, but its Euro roots were packaged in a Harley-themed motif with fat bodywork and above-average comfort. Simple, durable and straightforward in application, the V7 won over the California Highway Patrol and everyone began to notice. Keen 750 and 850cc variants followed the V700’s successful debut until 1974. Bonhams’ notes say the seller claimed a complete mechanical and cosmetic check had been completed, with every component disassembled, repaired or replaced where needed with OEM parts. During storage, the battery had corroded an otherwise mint sidecover so a matching original was installed and the tank resprayed. Apart from this the V7 is original and looked more than capable of taking its new owner home. Increased value? Sitting next to the V700 was a polished up BMW R90/S that hammered for $2000 less. These are worth owning. Accomplishing wide and varied success at the very highest levels of professional racing, brothers Steve and Lester Harris, along with Stephen Bayford, are renowned for their motorcycle chassis and component technology. Specialising in design since 1972, the fabrication side of the Harris works found the necessary machinists and welders skilled in the art of frame building, plus stylists to blend the function of speed into appealing style. The UK-based firm claims some 3000 road bikes have been produced and sold, from one-off specials to the well-known Magnum range. In June of 2015 Harris was purchased by Eicher Motors Ltd (the parent company of Royal Enfield) but the full line of Harris products –including the Magnum 2 frame kit – remains available on special order. 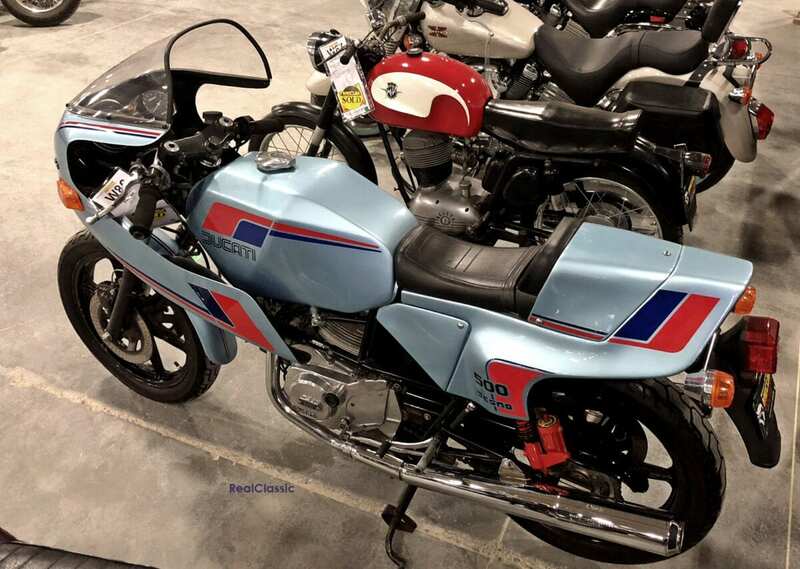 We were shocked enough to find this 1982-era Harris in a virtual sea of exotic motorcycles, and then flabbergasted by its build quality and condition. 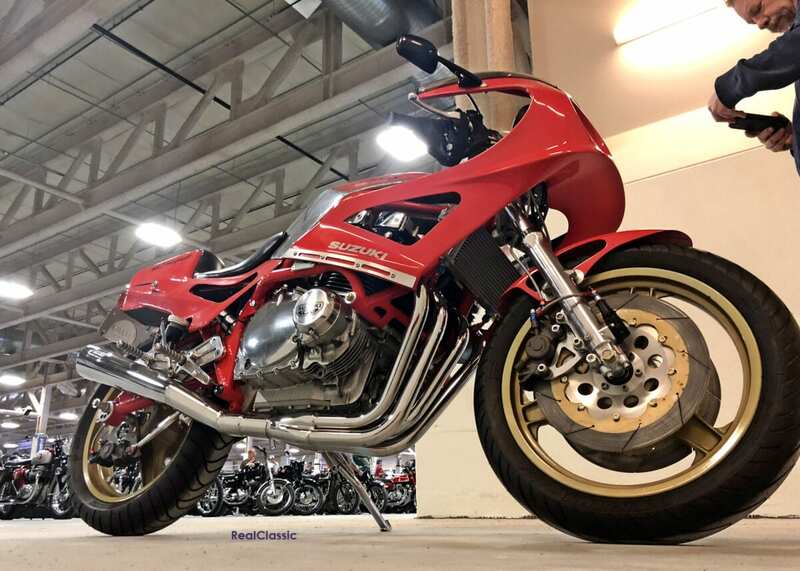 Extremely rare in the USA, this stunning example featured a full Yoshimura-built Suzuki GSX 1150cc engine, retrofitted with factory camshafts. Likely built from a Magnum 2 kit, the Harris frame is made of Reynolds tube fit with Harris yokes, Suzuki forks, Dymag magnesium wheels, triple Lockheed brakes and Katana clocks. The custom paint is sprayed over the Harris fibreglass and alloy tank, and what isn’t painted has been polished to perfection. Sadly, the seller’s paperwork didn’t meet Mecum approval, so the Harris was taken back to Texas where it will be listed at a later date. For a fan and follower of special-frame machines, I can safely say this is among the best any of us are likely to see.